Complete medical exams at your practice or dental clinic or conduct sensitive experiments in your laboratory with these medical grade gloves. These gloves have a durable construction that’s resistant to tears and punctures, but are also thin enough to provide excellent tactile response, which makes them ideal for medical purposes. Additionally, many of these medical grade gloves are colored, so you can easily tell when there’s a puncture or tear in the material and quickly replace them. 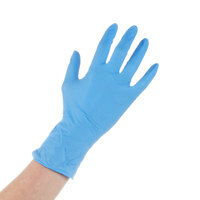 Use these medical grade gloves at your dental clinic, nursing home, laboratory, or educational facility to prevent the spread of bacteria and contact with potentially harmful chemicals. 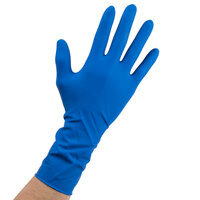 In addition to their durable exterior, medical grade nitrile gloves are very chemically resistant, so you don’t have to worry about cleaning chemicals or solutions coming into contact with your skin. Plus, because these products are disposable, you can simply throw them away when your medical exam is finished and replace them with a new and sanitary pair. For more safety equipment, check out our eye wash stations, protective safety glasses, and earplugs. If you're wondering where to buy medical grade gloves, we have a large selection of medical grade gloves for sale at the lowest prices.